[121 Pages Report] The global Polyphenylene Sulfide (PPS) market size is estimated to reach USD 1,574.7 Million by 2020 at a CAGR of 9.6% between 2015 and 2020. 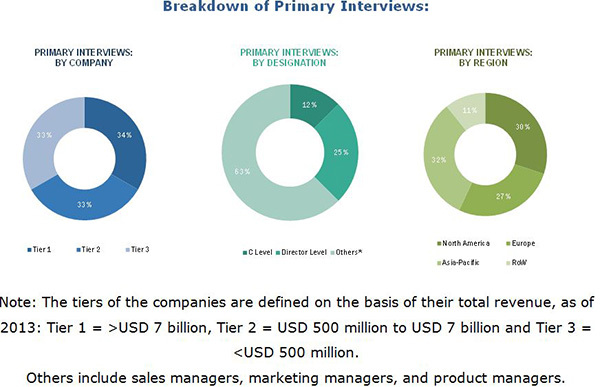 The report segments the polyphenylene sulfide market by application into automotive, electrical & electronics, filter bags, aerospace, industrial, coatings, and others, and by region into Asia-Pacific, North America, Europe, and RoW. Base year considered for the study is 2014, while the forecast period is between 2015 and 2020. Both top-down and bottom-up approaches have been used to estimate and validate the size of the global market and to estimate the sizes of various other dependent submarkets in the overall polyphenylene sulfide market. The research study involved extensive use of secondary sources, directories, and databases such as Hoovers, Bloomberg, Chemical Weekly, Factiva, and other government and private websites to identify and collect information useful for the technical, market-oriented, and commercial study of the global PPS market. The value chain of polyphenylene sulfide market starts with the sourcing of basic raw materials, manufacturing, compounding, and used for various end-use applications. Raw material suppliers are the para-dichlorobenzene and sodium sulfide or sodium hydrogen sulfide manufacturers and suppliers. Various companies, such as DIC Corp., Kureha Corp., Toray Industries, Fortron Industries LLC (joint venture of Kureha Corp. and Celeanse Corp.), Tosoh Corp. manufacture PPS resins. PPS resins should be reinforced by compounding with glass fiber, mineral reinforcements, or any other engineering plastic/polymer, as these are brittle. Companies have integrated facilities for in-house compounding, but there are also a few companies that have only compounding facilities. Development of newer technology shall also be an opportunity for the PPS market. SK. Chemicals has developed a new manufacturing process that is halogen-free and eco-friendly. Initz Co. Ltd, a joint venture between SK Chemicals and Teijin Ltd., uses this patented manufacturing process. This research report categorizes the global polyphenylene sulfide market on the basis of application and region. The polyphenylene sulfide market is further analyzed for the key countries in each of these regions. 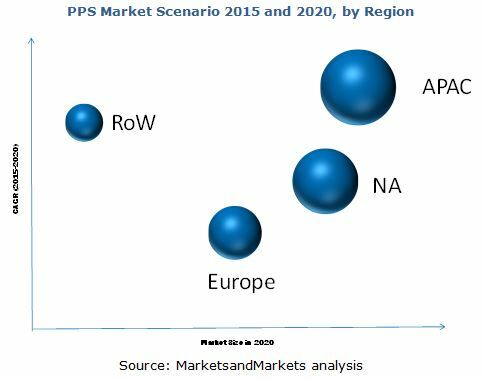 Country-level analysis of the PPS market by application. The global Polyphenylene Sulfide (PPS) market is estimated to reach USD 1,574.7 Million by 2020, registering a CAGR of 9.6% between 2015 and 2020. The polyphenylene sulfide market is driven by increasing demand for PPS in emerging markets and high demand from the automotive, electrical & electronics and filter bag application segments. PPS has unique properties, such as high temperature resistance, chemical resistance, flame retardancy, good electrical properties, and high dimensional stability, for which it is widely used in harsh fire-prone chemical environments. PPS is used in various applications, such as automotive, electrical & electronics, filter bags, aerospace, industrial, coatings, and others. In 2014, the automotive segment accounted for the largest market share, in terms of volume, followed by filter bags and electrical & electronics. PPS is used in the automotive industry for manufacturing under-the-hood components, including engines and auto body parts operating under high temperature and pressure environments. PPS is resistant to fuel and transmission & brake fluids at high temperatures. Automotive components such as fuel system parts, induction systems, coolant systems, lighting components, and electrical & electronic components are made from PPS. Increasing industrialization in emerging countries of Asia-Pacific is driving the polyphenylene sulfide market in automotive application. North America accounted for the second largest market share in the automotive application segment in 2014. PPS is used for manufacturing filter and filter bags used in coal-fired powered fire stations and dust chamber filters in incinerators. PPS can withstand both acidic environment and high temperature in coal-fired power plants. They are also cheaper than other fibers such as PTFE, aramid, and polyamides. Moreover, PPS filter bags have service life of three years in comparison to six months for glass fiber. This helps power plants significantly reduce operating costs along with downtime for maintenance activities. The filter bags application segment is projected to witness the highest CAGR between 2015 and 2020, in terms of value, closely followed by the aerospace application. With stringent regulations levied for particulate matter emissions from power plants, the need for PPS filter bags has increased, which have higher efficiencies. Also, the filter bag replacement market shall drive the filter bags application segment. Improving economies coupled with increased demand from the automotive, electrical & electronics, and filter bags application boost the market in Asia-Pacific. The region accounts for a major share in the polyphenylene sulfide market and is the largest producer of PPS globally. China is the largest market for PPS, but depends on imports for meeting its demand. Key market players are expanding their reach in the country by installing compounding plants. The local players are also projected to expand their manufacturing capacities owing to increasing demand for PPS. Japan is the largest producer of PPS resins worldwide with the presence of manufacturing sites of major industry players in the country. Japan and the U.S. have majority of the PPS resins manufacturing plants. These countries have been manufacturing more than their demand, thus creating an oversupply in the market. Currently, the Japanese companies are expanding their production capacities and reach in China with new capacities. DIC Corp. is set to have a new compounding facility in China, which is the largest market for PPS globally. With the available global capacity, industry players have been operating at low operating rates providing future expansion opportunities, depending on the growing demand. Hence, with further expansions in China, the overcapacity of PPS may create demand-supply gap, thus restricting growth of the global polyphenylene sulfide market. 10.10 Zhejiang Nhu Special Materials Co. Ltd.
10.11 Lion Idemitsu Composites Co. Ltd.